It’s that time of year when it’s actually okay to doorbell ditch (aka ding dong ditch) your neighbor. 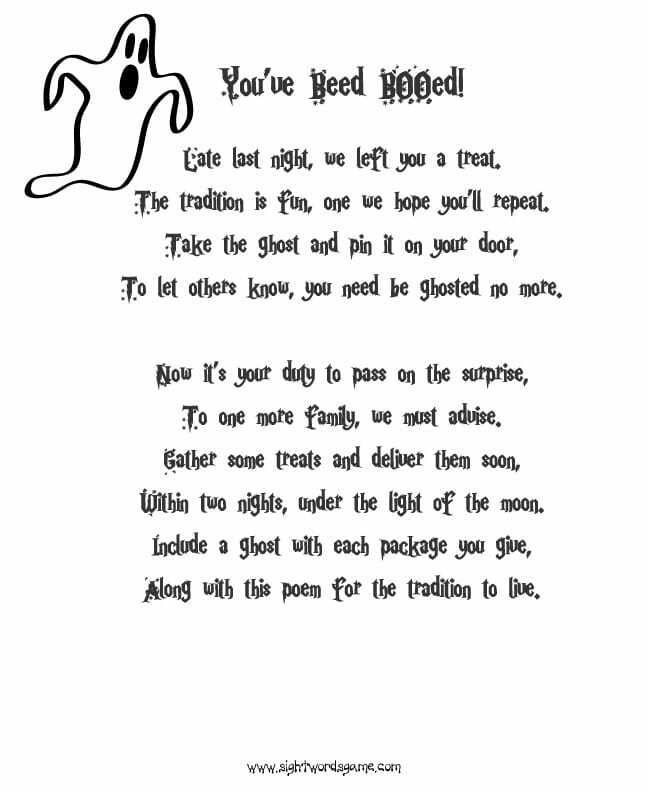 Of course, it comes with a price; you must leave a Halloween goodie basket filled with treats, a note and a friendly ghost. This is a great tradition to either start in your neighborhood or continue the past traditions and be the first to start it off. 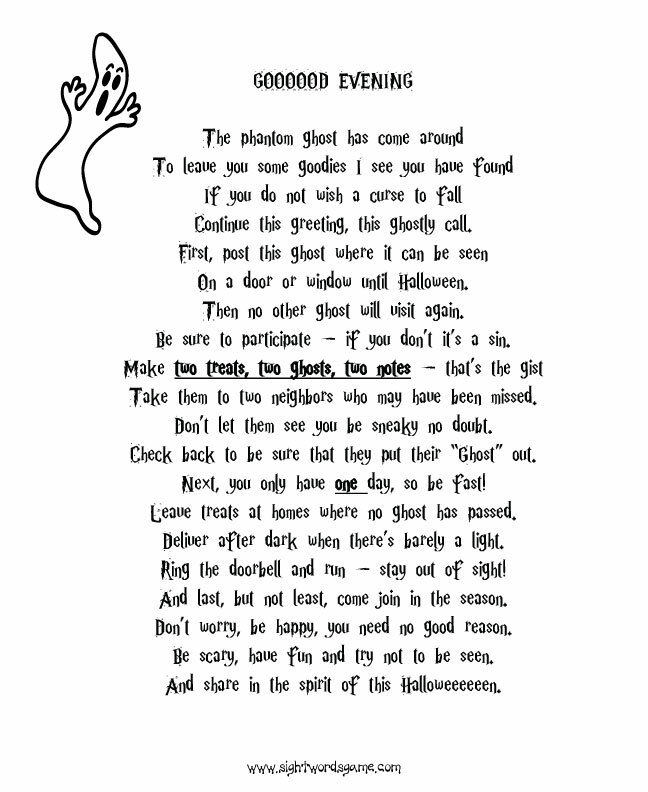 For those of you who are not familiar with this Halloween tradition, many neighborhood families “boo” each other in the month of October. 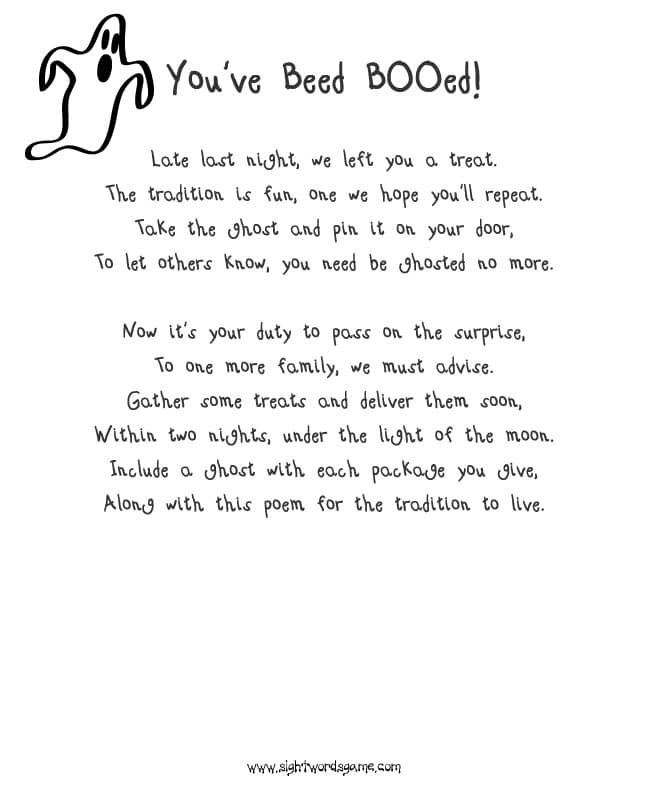 One family begins by leaving a bag filled with treats, a letter with instructions on what to do and a ghost to make sure they do not get “booed” again and so that another family receives this fun filled tradition. There are many different versions of this letter circulating today. We offer two different versions – one family or two families. We live in a neo-traditional community filled with over 2,000 dwellings – so we have many friends and classmates within minutes (even seconds) of our home. In fact, we can’t even narrow it down to 2 families so we tend to boo 4 or 5 families. Remember, this is the one time you can actually play doorbell ditch and not get in trouble. Seriously, my family has a blast dressing in black and hitting the streets commando style. We thoroughly enjoy the thrill of sneaking around and believe it or not we rarely get caught. 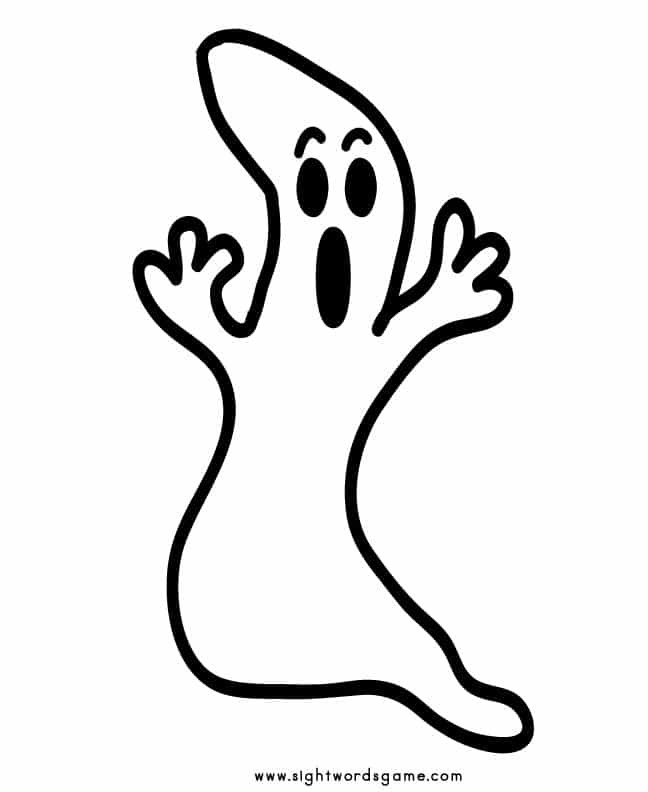 To let others know, you need be ghosted no more. To one more family, we must advise. 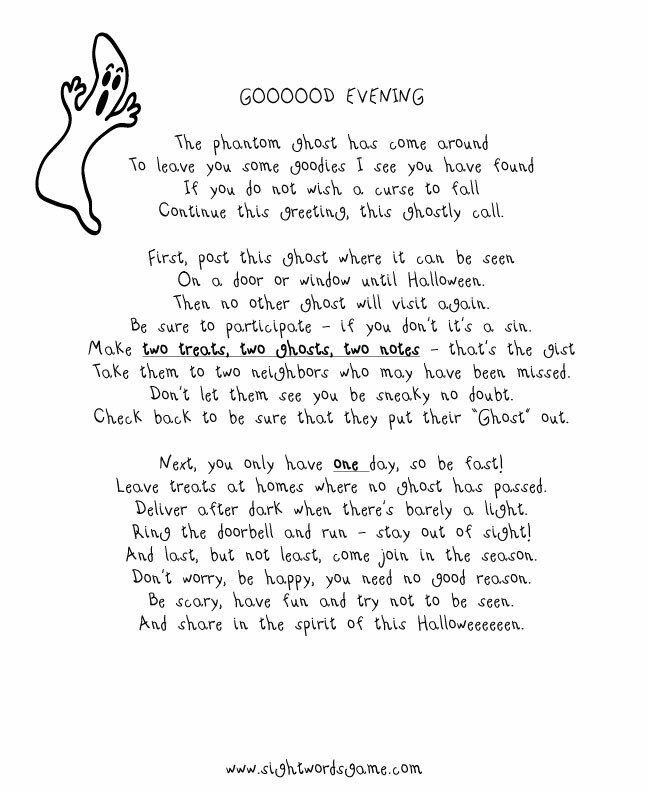 Continue this greeting, this ghostly call. On a door or window until Halloween. 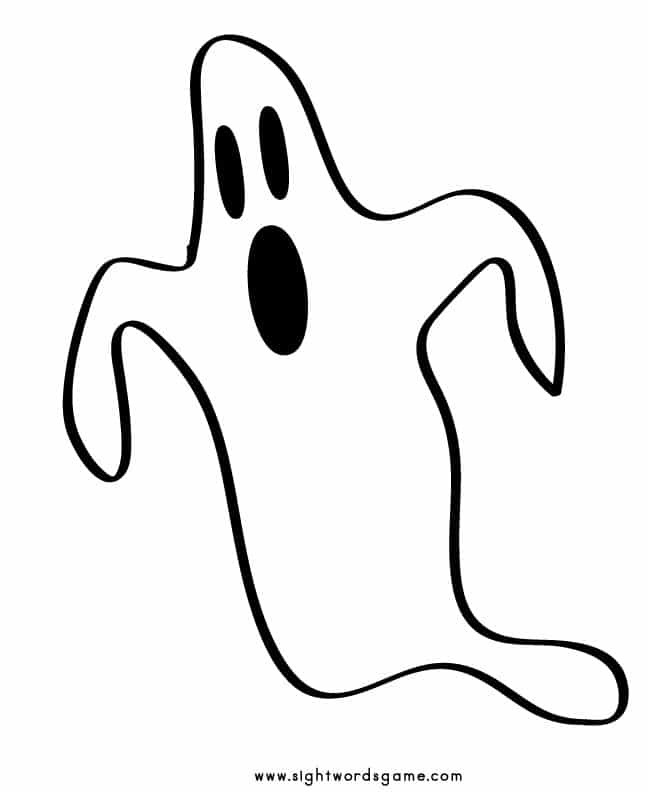 Then no other ghost will visit again. Be sure to participate – if you don’t it’s a sin. Take them to two neighbors who may have been missed. Don’t let them see you be sneaky no doubt. Check back to be sure that they put their “ghost” out. Next, you only have one day, so be fast! Leave treats at homes where no ghost has passed. Deliver after dark when there’s barely a light. Ring the doorbell and run – stay out of sight! Don’t worry, be happy, you need no good reason. Be scary, have fun and try not to be seen. And share in the spirit of this Halloweeeeeen. Halloween is such a festive holiday filled with bright colors and candy. One of the reasons I look forward to Halloween is because I thoroughly enjoy booing my friends with my family.